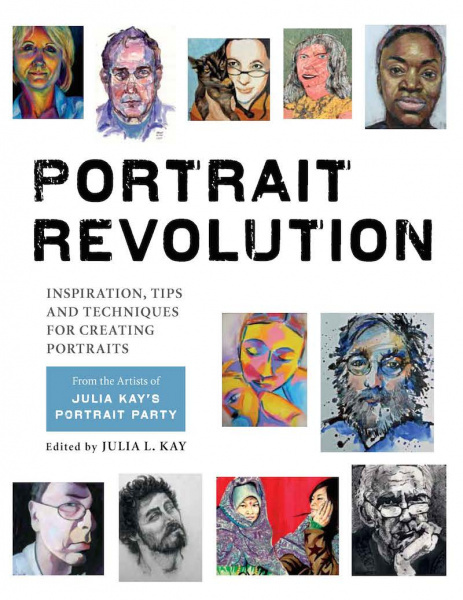 Portrait Revolution showcases 450 portraits by 200 artists, in a wide variety of media from oil painting to iPad art, watercolour to ballpoint, linocut to mosaic. Julia Kay’s Portrait Party is an international collaborative project in which artists all over the world make portraits of each other and share them online. After years of exchanging portraits, tips and techniques within the group, in Portrait Revolution these artists are now sharing their art, their words, and their inspiration with everyone who is interested in or would like to get started with portraiture. Here you can find information on using different media, how to handle difficult portrait issues, and more. Portrait Revolution showcases 450 portraits by 200 artists, in a wide variety of media from oil painting to iPad art, watercolour to ballpoint, linocut to mosaic. There are a range of styles from realistic to abstract and interpretations by multiple artists of the same subject. Julia L. Kay is a painter, printmaker, photographer, muralist and digital artist who was born and raised in New York City. She has a BA in Photography from Wesleyan University and did graduate work at the Maryland Institute College of Art. She lives in San Francisco, where she’s had the opportunity to complete commissions and to exhibit locally and internationally. In 2010, on completion of her project to draw herself every day for three years, Julia launched Julia Kay’s Portrait Party. The party has over 1000 members from more than 55 countries. In the first seven years of its existence, the members made more than 50,000 portraits of each other. "As a visual feast, it offers an endless source of inspiration."